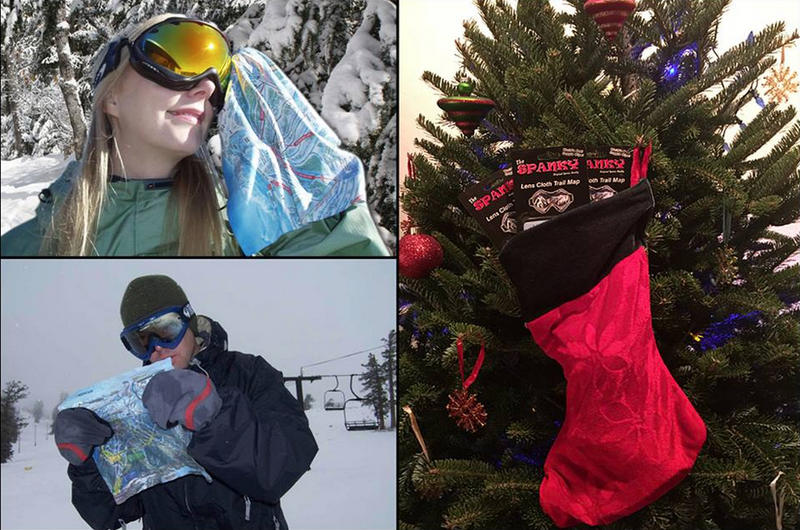 What’s your criteria for a perfect stocking stuffer? Let’s see — it should be small, useful, fun, and under $10 or less. And, the Spanky is all of these! Let’s face it, sometimes those gifts in the stocking fill some space, but how useful and long term is a piece of candy or a tube of lip balm? Not that we don’t love our lip balm too (in fact, Savannah is a lip balm addict). But, the Spanky for Christmas is something the lucky (big or little) kid on Santa’s nice list can enjoy and use daily… long after the tree comes down and the last snowflake falls! One holiday, a gentleman ordered 2 Spankies – one for him and one for his brother. He said that their father, who had since passed, was nicknamed “Spanky” and they used to ski with him. Stories like this always warm our heart. Over the years, we have enjoyed learning more about what the Spanky means to each person. Perhaps your loved one will use the map to navigate the mountain, dream of the perfect winter vacation, or reminisce about a trip they took with someone special. They will also love using the Spanky to clean the smudges from lenses and screens day after day and year after year, all without breaking Santa’s budget. And you’d better hurry if you need them for stockings, as it’s already December 18th! We hope you are lucky enough to get a Spanky in your stocking this Christmas. Happy holidays!